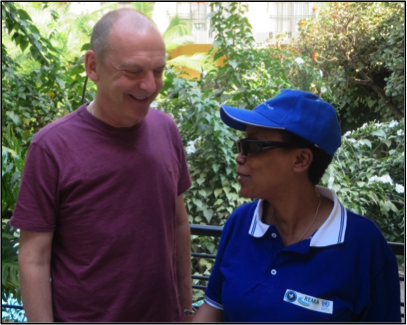 Professor Geoff Layer, the Vice Chancellor of the University of Wolverhampton visits Rwanda and is briefed on the FONERWA Programme and Rwanda’s Green Growth Strategy. 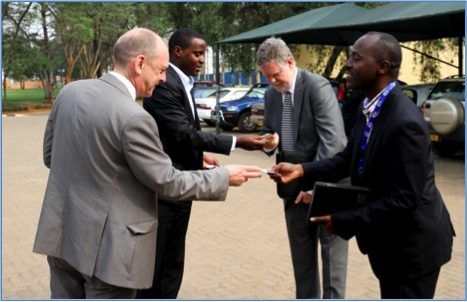 Above: Professor Geoff Layer, the Vice Chancellor of the University of Wolverhampton, recieves an introduction to FONERWA from Bright Ntare, FONERWA Programme Manager (right) and Teddy Mugabo, FONERWA District Support Specialist (left) during his visit to Rwanda. The Vice-Chancellor was told that the Government of Rwanda is keenly aware of the economic risks and opportunities for sustainable socio-economic development presented by climate change. Rather than choose between environment or development, Rwanda is looking for ‘green growth’ solutions and a pathway to a carbon neutral economy. 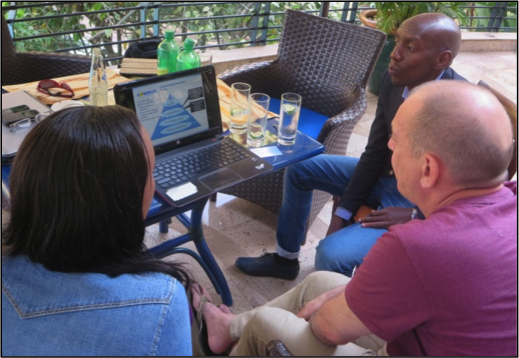 Programme Manager Bright Ntare explained that FONERWA is the primary vehicle through which climate finance is channelled and disbursed in Rwanda, as an effective nationally-coordinated response to climate change risks and opportunities. FONERWA is now the largest demand-based Government-owned climate fund in Africa. The speed of the capitalisation of FONERWA, compared to other countries’ attempts to design similar funds, is remarkable – with finance mobilised in less than a year of the Fund’s design. This success was due to early engagement of potential donors and the Government’s integration of climate compatible development into national policy. District Support Specialist Teddy Mugabo explained that “The real result of the Fund will be the successful implementation of its strong pipeline of climate change projects.” With over 20 projects approved by the fund management committee, early results are emerging in different areas such as watershed management, sustainable land management, renewable energy and green building. The Vice-Chancellor also met a key FONERWA champion Dr Rose Mukankomeje of the Rwanda Environmental Management Authority (REMA). REMA is the Rwandan state institution responsible for ensuring that issues relating to environment and climate change are integrated in all national development programmes. REMA plays a leading role in ensuring the implementation of the national Green Growth and Climate Resilience Strategy adopted in 2012, by all sectors of the economy . Together with the Ministry of Natural Resources and the Fund for Environment and Climate Change (FONERWA), REMA is responsible for developing a Green Economy approach for the country’s economic transformation. Professor Geoff Layer visited the new Minister of Education in Rwanda, Dr Papias Malimba Musafiri for discussions on collaboration and future work programmes. 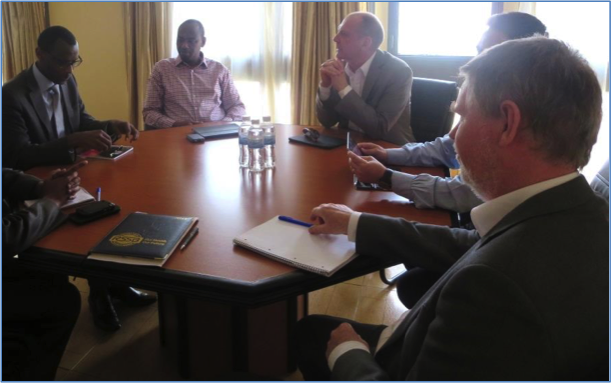 He also held meetings with a number of Education and Training Insitutes in Rwanda to discuss a wide range of possible collaborative work and programmes between the University of Rwanda and the University of Wolverhampton. Above: (left to right) Professor Geoff Layer, Vice Chancellor of the University of Wolverhampton, Eng. Diogene Mulindahabi, Principal of the Intergated Ploytechnic Regional Centre (IPRC), Professor Philip N. Dearden, Head of Centre for Internaional Development and Training (CIDT), University of Wolverhampton, and Benimana Jean Claude, Vice Principal in Charge of Academics and Training IPRC. 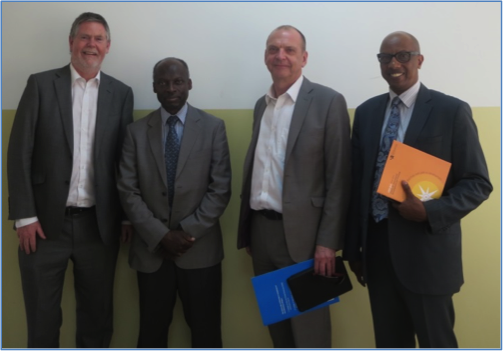 Above: (left to right) Professor Philip N. Dearden, Head of CIDT, Professor Nelson M. Ijumba, Professor Geoff Layer, Vice Chancellor University of Wolverhampton and Dr Innocent S. Mugisha, Executive Director, Higher Education Council, Republic of Rwanda. Above: (left to right) Dr Papias Malimba Musafiri, Minister of Education, Albert Nsengiyumva, Minister of State in Charge of Technical and Vocational Education and Training, Professor Geoff Layer, Vice Chancellor of University of Wolverhampton, Laurence Foure, Head of International Recruitment, University of Wolverhampton and Professor Philip N. Dearden Head of CIDT, University of Wolverhampton.